If you missed my post about My Valentines Day Scheme, let me quickly get you up to speed. I have always loved Valentines Day!! But my wedding anniversary is Feb. 19th, so we never celebrate V-day cause my anniversary is right around the corner. As a solution, I developed this scheme to surprise my hubby with a sitter and make this amazing dinner so we would start celebrating Valentines again. Caught up?? Ok good!! So, yesterday was “D” Day!! Got up early! Ran to the grocery store, cause I didn’t want my hubby to find any of the meal supplies and be like, “What’s this for?” Got napkins, place mats, these amazing hydrangeas, gorgeous goblet/wine glasses (Even though we don’t drink. It was more to set the stage and for the feel then anything. But I had to have them), and whatever other ingredients I had on my list. Started setting up about 12:00pm. I even got on YouTube and found out how to do napkin origami. Oh come on, don’t laugh!! Don’t it make it feel so fancy though!? I really wanted my hubby to be blown away. I mean, there’s no point if in the back of his mind he’s thinking, “We should have just gone to a restaurant.” And by now, you probably all know I can’t do anything half way. Go big or go home, right!? After hours of cooking it was time for dinner. The kids got swept away to the babysitters, which conveniently lives down the street so she could just come pick them up. My hubby is munching on the Spinach Artichoke Dip, that I did not get pictures of cause I didn’t want to disturb our dinner to much by staging and photographing everything I made. So I will have to make again and post the recipe later. Then we sat down over candles and ate this amazing dish!! Anyways, back to this dinner. Yes, it is a little bit of work, but so worth all the effort. Most amazing dinner I’ve made to date. And super impressive if I do say so myself 😉 Enjoy!! First, prepare cream sauce and onion strings. Set aside for assembly. Warm up your grill and place rack on it’s lowest setting (charcoal is recommended). In a large pot, start boiling water and add your potatoes. Cook for 20 minutes. Meanwhile, season you filets with all the steak seasoning making sure to season both sides of your filets and place on the hot grill. After a couple of minutes turn over. Continue flipping and cooking until steak has reached desired doneness. For medium, your steaks will take about 10 to 15 minutes, depending on their thickness. Rap in tin foil to keep warm while you complete final assembly of plates. Drain cooked potatoes and place in a large bowl. Add butter and 1/2 cup milk. Using a mixer, mix until potato mixture is smooth. Add more milk, 1/2 cup at a time. You want you potatoes to be a little thinner then traditional mashed potatoes, but not runny. Once to desired consistency add garlic salt and pepper to taste. Reheat Red Pepper cream sauce and spoon onto plates. Your gonna want about 3 to 4 tablespoons down. Spread out in a circle using the back of a spoon. Top sauce with mash potatoes. Sprinkle parsley over potatoes and sauce to make it pretty. Top with your filets and then pile onions on top of steak so that they balance without falling into the sauce. Serve immediately. Preheat broiler. Line a cookie sheet with tin foil. Slice peppers in half and deseed. Place on foil cut side down. Lightly coat the tops of the red peppers with olive oil. Grill peppers under the broiler until the skin is blackened, and the flesh has softened slightly. Set aside for a couple of minutes to cool. Once cool enough to handle, remove the skin from the peppers (the skin should come off the peppers relatively easily). Cut peppers into small pieces. In a skillet, cook and stir the garlic, basil, and red peppers in 3 tablespoons olive oil over medium heat. Cook for 10 minutes, so that the flavors mix. Place mixture in blender with half-and-half, and puree to smooth consistency. Return puree to skillet and whisk in flour. Heat to a boil and add in Romano cheese and butter; cook and stir until both are melted. Season with salt and pepper to taste. Simmer for 5 minutes. Grab a handful of onions, throw into the flour mixture, tap to shake of excess, and plunge into hot oil. Fry for a few minutes and remove as soon as golden brown. Repeat until onions are gone. 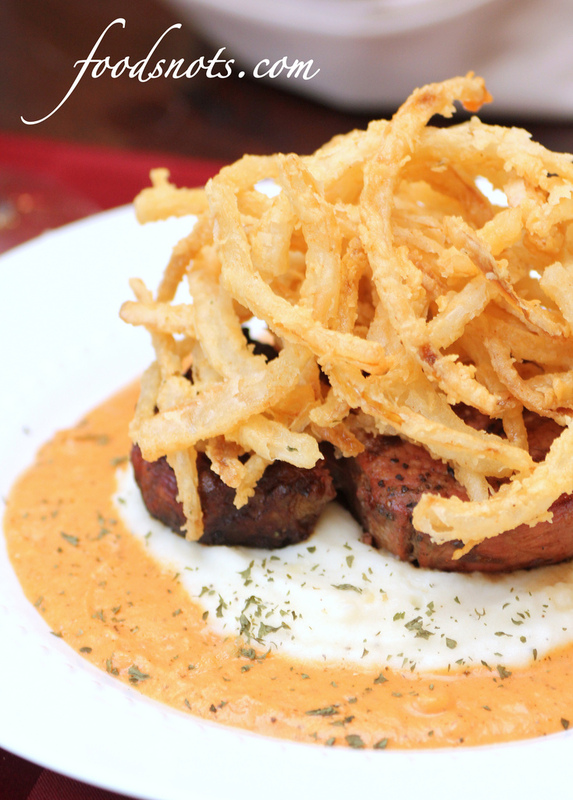 Let onion strings cool for a couple of minutes and then assemble atop the assembled steak.